1. Satellite images and surface observations indicate that the low pressure system located over the northwestern Caribbean Sea justeast of the Yucatan Peninsula of Mexico has become better defined overnight, and thunderstorm activity has also increased and become better organized. 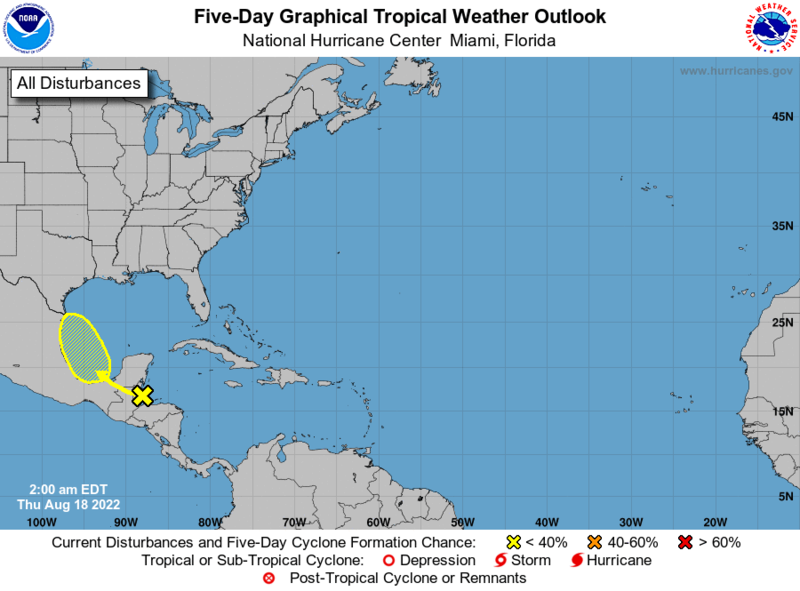 Environmental conditions are forecast to steadily become more conducive for development, and a subtropical or tropical depression or storm is likely to form by Saturday over the northwestern Caribbean Sea or the southeastern Gulf of Mexico. An Air Force Reserve reconnaissance aircraft is scheduled to investigate the low this afternoon. Locally heavy rainfall is forecast across western Cuba and over much of Florida and the northern Gulf Coast into early next week. This system could also bring tropical-storm-force winds and storm surge to portions of the northern Gulf Coast by late this weekend or early next week. In addition, the threat of rip currents will steadily increase along the Gulf Coast from Florida westward to Louisiana over the Memorial Day weekend. For more information on these threats, please see products issued by your local weather office, and see High Seas Forecasts issued by the National Weather Service for information on gale warnings associated with this system. The next Special Tropical Weather Outlook on this system will be issued by 200 PM EDT today. * Formation chance through 48 hours…high…90 percent. High Seas Forecasts issued by the National Weather Service can be found under AWIPS header NFDHSFAT1, WMO header FZNT01 KWBC, and the Web at http://ocean.weather.gov/shtml/NFDHSFAT1.shtml. Here is NOAA GOES-16 visible satellite imagery loop (courtesy of College of DuPage) from this morning (with lightning data overlain). Looks like there is a low-level circulation center just off the coast east of Chetumal. This reply was modified 11 months ago by playaweatherman. Tropical Cyclone Notice from SMN (click to go to SMN page). We now have Subtropical Storm Alberto. And Tropical Storm Watch for Riviera Maya. 1. Regardless of its exact track and intensity, Alberto is expected to produce heavy rainfall and flash flooding over the northeastern Yucatan Peninsula of Mexico, western Cuba, southern Florida and the Florida Keys. Rainfall and flooding potential will increase across the central Gulf Coast region and the southeastern United States later this weekend and early next week when Alberto is expected to slow down after it moves inland. A Tropical Storm Watch means that tropical storm conditions are possible within the watch area, in this case within the next 24 hours. Interests along the central and eastern U.S. Gulf Coast should monitor the progress of Alberto. Tropical storm and storm surge watches could be required for portions of this area later today or tonight. At 100 PM CDT (1800 UTC), the center of Subtropical Storm Alberto was located near latitude 19.5 North, longitude 86.5 West. The storm has been nearly stationary during the past several hours. However, a general slow motion toward the north is expected through the weekend, followed by a northwest turn by Monday. On the forecast track, Alberto is expected to pass near the eastern coast of the Yucatan peninsula tonight, be near the western tip of Cuba Saturday morning, emerge over the southeastern Gulf of Mexico by Saturday night, and approach the north-central Gulf Coast on Monday. Maximum sustained winds are near 40 mph (65 km/h) with higher gusts. Gradual strengthening is forecast for the next 72 hours. Winds of 40 mph extend outward up to 115 miles (185 km) from the center. RAINFALL: Alberto is expected to produce total rain accumulations of 10 to 15 inches with isolated totals of 25 inches across the northeastern portions of the Yucatan Peninsula and western Cuba. These rains could produce life-threatening flash floods and mudslides. Rainfall accumulations of 4 to 8 inches with maximum amounts of 12 inches are possible across the Florida Keys and southern and southwestern Florida. Heavy rain will likely begin to affect the central Gulf Coast region and the southeastern United States later this weekend and continue into early next week. Flooding potential will increase across this region early next week as Alberto is forecast to slow down after it moves inland. WIND: Tropical storm conditions are possible within the watch area through Saturday. SURF: Swells generated by Alberto are affecting portions of the coast of eastern Yucatan Peninsula and western Cuba. These swells are likely to cause life-threatening surf and rip current conditions. Hazardous surf conditions are likely to develop along much of the central and eastern U.S. Gulf Coast this weekend. For more information, consult products from your local weather office. A Storm Surge Watch has been issued for portions of the northern Gulf Coast of the United States from Horseshoe Beach, Florida, westward to the Mouth of the Mississippi River. A Tropical Storm Watch has been issued for portions of the northern Gulf Coast of the United States from Indian Pass, Florida, westward to Grand Isle, Louisiana, including Lake Pontchartrain, Lake Maurepas, and metropolitan New Orleans. A Storm Surge Watch means there is a possibility of life-threatening inundation, from rising water moving inland from the coastline, in the indicated locations during the next 48 hours. For a depiction of areas at risk, please see the National Weather Service Storm Surge Watch/Warning Graphic, available at hurricanes.gov. A Tropical Storm Watch means that tropical storm conditions are possible in the Yucatan and Cuba portions of the watch area, in this case within the next 24 hours. A Tropical Storm Watch means that tropical storm conditions are possible in the United States portion of that watch area within 48 hours. At 400 PM CDT (2100 UTC), the center of Subtropical Storm Alberto was located near latitude 19.4 North, longitude 86.3 West. The storm is moving toward the east near 2 mph (4 km/h). A slow and erratic motion toward the north is expected tonight. From Saturday afternoon into Sunday, a general northward motion at a faster forward speed is expected, followed by a turn toward the northwest on Monday. Maximum sustained winds are near 40 mph (65 km/h) with higher gusts. Gradual strengthening is forecast during the next 48 hours, with little change in strength forecast on Monday. Winds of 40 mph extend outward up to 140 miles (220 km) from the center. The estimated minimum central pressure is 1005 mb (29.68 inches) based on recent data from an Air Force Reserve reconnaissance aircraft. WIND: Tropical storm conditions are possible within the watch area in Cuba and the Yucatan Peninsula through Saturday. Tropical storm conditions are possible within the United States watch area beginning on Sunday. The deepest water will occur along the immediate coast. Surge-related flooding depends on the relative timing of the surge and the tidal cycle, and can vary greatly over short distances. For information specific to your area, please see products issued by your local National Weather Service forecast office. Latest GOES-16 satellite visible image loop of Subtropical Storm Alberto. RAINFALL: Alberto is expected to produce total rain accumulations of 10 to 15 inches with isolated totals of 25 inches across the northeastern portions of the Yucatan Peninsula and western Cuba. WIND: Tropical storm conditions are possible within the watch area in Cuba and the Yucatan Peninsula through Saturday. SURF: Swells generated by Alberto are affecting portions of the coast of eastern Yucatan Peninsula and western Cuba. Here are numerical model forecast tracks for Alberto courtesy of the South Florida Water Management District. Alberto moving away from Riviera Maya. Mention of heavy rain removed from NHC advisory, but still dangerous swells and surf. WIND: Tropical storm conditions are possible within the watch area in Cuba and the Yucatan Peninsula through today. Tropical storm conditions are possible within the United States watch area beginning on Sunday. SURF: Swells generated by Alberto are affecting portions of the coast of eastern Yucatan Peninsula and western Cuba. These swells are likely to cause life-threatening surf and rip current conditions. GOES-16 visible satellite loop early this morning shows Alberto moving away and most rain and storms well off shore; just some low clouds (and maybe light rain) around Riviera Maya. Tropical Storm Watch dropped for Riviera Maya! Alberto continues to move away but still risk of high surf and rip currents along Riviera Maya. Be careful if you get into the Caribbean!